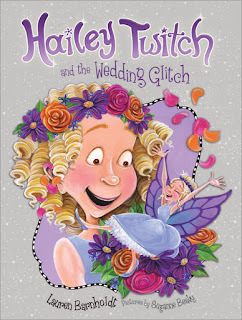 Every girl dreams of being a flower girl in a wedding and Hailey Twitch is no different. Hailey is back in book four of this intriguing series in HAILEY TWITCH AND THE WEDDING GLITCH. The bride is Hailey's cousin Genevieve and yes, Hailey will get to wear a "fab, fab, fabulous princess dress." But Hailey's closest confidante, a magic sprite named Maybelle, might have to go back to living in her magic castle and leave the Twitch house for good. Can Hailey make it through the wedding and come up with a plan to keep Maybelle her friend forever? Hailey might be seven, but don't underestimate her. This was my first trek into Hailey-ville and I must say, young readers will love this book and will be excited to check out the rest of the series. First off, any girl will be pulled into this book by the cover alone, which glitters and sparkles as much as any wedding dress. And as soon as they open the book, they'll be pulled in by Hailey herself, who is entertaining, funny, and mischievous.This is a whimsical, charming story perfect for any emerging reader who's dreamed of being a flower girl and wearing sparkly shoes! Enter the Max McTrue Flash Fiction Contest!